This started out as a small piece about the upcoming Marvel title Jessica Jones series on Netflix, and it exploded with words from m'brain about any plans we may know of about the number of series coming from Marvel Television to Netflix. What can I say? I like pondering these things and my fingers like echoing my thoughts. 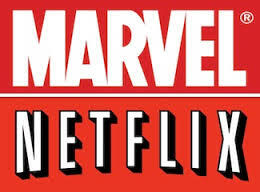 Netflix's Marvel series, Jessica Jones series is coming to air sometime in the fourth quarter of 2015. Jessica Jones will star Krysten Ritter (Breaking Bad, Don't Turst the B---- in Apt 23) in the title role and David Tennant (Doctor Who, Gracepoint, Broadchurch) with playing a bad guy called The Purple Man. Jessica Jones will also help launch the 2016 series, Luke Cage, who will be played by Mike Coulter. BTW, Jones and Cage have a thing, and Cage (AKA Power Man) is a hero who has unbreakable skin and superhuman strength. After the Luke Cage series, we'll then get a series focusing on Iron Fist. AND after those shows, including Daredevil, have had their run, then there will be a group series called The Defenders. Depending on the individual series success, the better performing shows will probably run into multiple seasons. Plus, in the comics, Cage and Fist were a team under a single comic title for the longest time. So there's that other possibility for a new show, if they go that route. We also know that The Punisher, played by Jon Bernthal, will be showing up in season two of Daredevil, and during a TCA session (Television Critics Association Summer Press Tour), that they have options with various characters like Frank Castle (Punisher). If The Punisher plays out well under the Daredevil series, could the character get his own series? Anything is possible. And fans can hope, right? I'm OK with that. Sure, his primary mode of dealing with bad guys is guns. So it will be a balance of how they tone the character down. That's for sure. BUT, fans also wonder if we'll ever see any of the TV characters in a big screen Marvel feature? Right now, the answer is no. But only because we have yet to see reference to TV characters in any of the films, while TV story lines depend on references to the primary movie characters here and there. IE: IN Daredevil, we heard reference once or twice about the guy in the suit or the guy with the hammer. The same with Agents of SHIELD.